Ribera wines underscore the purest expression of Tempranillo, Spain’s most well grape; big, bold and textured, but with plenty of rich, old-world sensibility. The region is home to some of Spain’s most sought after and applauded wines. Riberas are crafted to age, developing complexity over time, yet balancing acidity and generous fruit, they’re unequivocally food-friendly wines to drink young. The spices, dark fruit and smoky flavors of Ribera enhance anything off the grill, roasted meats, and rich pastas. Ribera del Duero wines can best be compared to Cabernet Sauvignon from the Napa Valley thanks to those rich and bold flavors, but tend to be more refined and Old World in style, more balance and less overpowering oak. 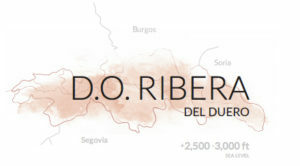 The vineyards of Ribera del Duero stretch intermittently for over 70 miles along the River Duero. These sprawling lands feature a mix of different soils, exposures and elevations – some as high as a half-mile above sea level. The semi-arid terrain, ample amounts of sunlight and extreme temperature swings from day to night — sometimes a 50-plus degree difference — create optimal ripening conditions for the Tempranillo grapes that define Ribera del Duero wines distinctive character. This grape is a matter of great pride for the region. Known locally as “Tinto Fino” to distinguish it from other nearby Tempranillo producing areas, it represents 95% of all the grapes grown in the D.O. Old Tempranillo vines are the signature of Ribera. Vines 25 years and older represent about 35 percent of all vines planted — meaning a significant percentage of the vines have roots deep and nourished enough to survive the harsh climate and produce even yields with minimal worries compared to younger vines. With fruit that tends to be smaller in size, old vines have a reputation for producing more structured and balanced wines. The average yield of around 1.6 tons per acre produces a rich, complex red wine with notes of red berries, warm spices, leather and tobacco leaves. The winemakers in D.O. Ribera del Duero combine traditional expertise with new technologies to define their individual style. This includes triage tables and optical sorting, where human hands and eyes select only the best quality grapes to be pressed. Many winemakers here make expressive single vineyard wines. Others, using Tempranillo from different plots, can expertly achieve a balance and complexity other regions can only dream of through blending several varieties of grapes. The winemakers tending to the vines [in this marginal climate] take nature’s challenges with a smile. They use the adversity to their advantage, utilizing innovative production techniques paired with good old-fashioned know-how — centuries worth of it — to produce world-class reds that can rival any other famed region in Spain and beyond. Ribera is now proud to host 270 wineries, with 55,000 acres of vineyards.